Are You Having Problems With Your Sewer? Sewer repair can feel like a homeowner’s worst nightmare. After all, it’s a major repair to your Simpsonville, SC home, and you often can’t stay in your house while the repair is being performed. You may need to move out or stay in a hotel until it’s done. Even though it’s a significant task, Corley’s plumbers are up for the job. Give us a call and let us deal with the stress of your sewer repair. Your homeowner’s insurance or home warranty may even help you out, too. The length of your sewer repair will depend on exactly what needs to be done to your sewer line. However, we strive to work fast, because we know how inconvenient it is for you to be out of your home. We value your time and energy, and we want to get you back where you belong just as soon as possible. 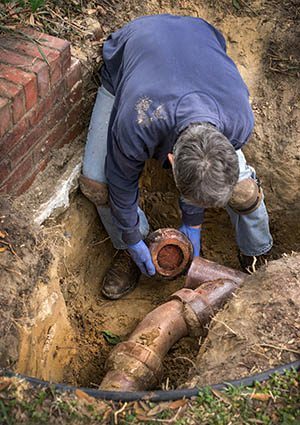 Many homeowners worry about what will happen to their lawns and vegetation during a sewer repair. However, these folks are usually thinking about the old method of sewer repair. That would involve men digging a trench along the entire length of the sewer, taking up whatever vegetation was in the way. Sometimes, it even meant taking up things like sidewalks and driveways, if the sewer line happened to run underneath these. Fortunately, that’s not how sewer repair is usually done anymore. Instead of digging everything up, we simply access your sewer through the line access inside your home. This may be in your basement or near wherever your furnace and water heater are. Don’t worry if you can’t find it. Our plumbers will be able to locate it. This kind of sewer repair is called trenchless sewer repair, and it is much easier than doing it the traditional way. We may need to dig one or two small holes in your yard, but that’s nothing compared to the way these repairs used to be done! In place of all the digging, we use technology, instead. This allows us to see inside your pipes to locate the problem and determine how we want to repair it. Then, it allows us to actually access the insides of your pipes. We use all sorts of creative technological resources to ensure that we can fix your pipes while maintaining the integrity of your yard. Trenchless sewer repair makes the process so much easier for everyone. Your Simpsonville, SC home gets a new sewer line, and your yard stays intact at the same time. No matter the extent of your sewer repair, our plumbers have the skill and the equipment to tackle the job. They’re also experienced in sewer repair, so you can feel confident that the job will get done right, the first time. They’ll work as quickly as they can while still ensuring the quality of the repair. In the end, you should come home to a house that works as it should.